In "[Editorial] Seoul’s rail project" (subtitled "Debacles in other cities should serve as lesson"), the editors accuse PARK Won-soon of pushing a pharaonic and ill-financed program of 10 new light railway lines in the capital (including new tributaries to the ones listed earlier this month, see "Seoul Light Rapid Transit Back On Tracks"), which would cost KRW 3.5 tn to a city already KRW 26 tn in the red (the government would foot 1.1 tn of the bill, leaving 3.9 tn to private investors), not counting yearly compensations for the operators. 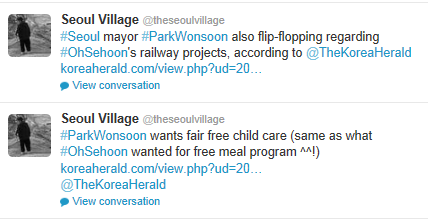 The Seoul Mayor is also suspected of outrageously flip-flopping on the issue in order to boost his ratings ahead of next year's elections: he cancelled 6 of the 7 lines initiated by his predecessor OH Se-hoon, and now he's pushing even further. In "Seoul City may halt free child care", we learn how Seoul Metropolitan City criticizes PARK Geun-hye's government for promoting a non-sustainable free child care program for all kids under 5. PARK Won-soon asks the government to raise its subsidies from 20 to 40% because unlike more demographically challenged regions, his financially challenged city has to cope with 408,000 of these little citizens. If he mentions the fact that 42% of them are raised in wealthy households (top 30% bracket), PARK Won-soon doesn't go all the way and say that 42% of these kids may not necessarily need a $180 check every month, because he himself was elected on a non-sustainable free meal program that contributes to the said deficit (reminder: ironically, OH Se-hoon was the one proposing the "leftist" model where the rich would pay for the poor - see "Welfare in Korea: the debate (or lack of)" 2012 and "Seoul free school lunch referendum (continued)" 2011). But there's an awful lot to say about Seoul's new railway projects. We're Thursday and, as I just wrote this morning*, I haven't finished yet. So I'll post today the part about the big picture, and the one about the 10 Light Rail Transit projects will follow as soon as I can. But first, my two cents about welfare. Of course, that's just politics as usual. The Saenuri Party wants to claim back Seoul, and this free child care for all almost sounds like an ironic joke ("so you fancy universal freebies, uh?") at the expense of a man who could also become a serious menace for the 2017 presidential elections: elected as an independent, PARK Won-soon is now running for the DP, and leveraging Korea's most powerful local authority to multiply popular/populist initiatives, leaving his only potential rival to date AHN Cheol-soo very much isolated, with little political machinery around him, and little media coverage. I already made my point about welfare state, the state of welfare, and the state of the debate on welfare in Korea. Again, PARK Won-soon must give up ideology and populism, embrace pragmatism, and among other things stop offering free meals to the wealthiest. And again, Saenuri and the governement must also give up their own ideology, populism and pharaonic pork-barrel projects, and among other things promote a sound and sustainable welfare system, and carry out the structural reforms needed to revive Korean demography (including in the education system...). Unfortunately, reason remains most of the time a foreign word in Korean politics nowadays. Significantly, in its revised Seoul Metropolitan Rapid Transit Master Plan**, the city is using the word "welfare" to qualify new railway projects. That's typical PARK Won-soon "human-centric-on-the-fringe-of-populism" lingua, but I do believe in public service, and in public transports as a fundamental right for metropolitan citizens. Besides, "welfare" and "fare well" are akin. I'm not for or against anyone. I want Seoul, the region, and Korea as a whole to succeed and to invest wisely when it's still possible. And when I say "Korea as a whole", I mean both Koreas: the frontier is very close, and it won't remain closed forever. At this moment, just like Korea has a welfare deficit, Seoul has a railway deficit, so if you ain't broke, fix it. 10 years from now, all Seoulites shall live within a 10 min walk from a subway station. Or rather the overwhelming majority of Seoul citizens: the most remote parts of this mountainous city are not solely populated with Steve Austins, Jaime Sommerses, and other Usain Bolts. That's the ambitious target fixed in the revised Seoul Metropolitan Rapid Transit Master Plan** expected (in whose dreams?) to be validated next year by the Ministry of Land, Infrastructure and Transport. Seoul will officially submit the plan in September. Compared to earlier versions, the vision has been a bit simplified at the macro level and complexified at the micro level. I'll get into the details for the suggested improvements to the "broadband" backbone and Light Rail Transit projects, but one thing is sure: Seoul does need more railways. If I already questioned the economic viability of the new light rail lines, I disagree with those who think that buses will solve everything. Even if the Seoul bus network is very efficient, railways mean high capacity and consistency, and they represent the main backbone for any metropolis, a core element of multimodal transportation systems aiming at reducing the use of cars and promoting public services and greener individual modes (pedestrians, cyclists...). Clearly, Seoul is still lagging behind key rival capitals. Subways carry only 36% of Seoul passengers (28% take buses / 31% cars or taxis / 5% other), compared to 86% in Tokyo (1 / 11 / 2%), 65% in London (8 / 25 / 2%), and 58% in Paris (9 / 28 / 5%). At the macro level, Seoul wants to beef up its "broadband" backbone, and to strengthten the 'Hanyang-Gangnam-Yeouido' triangle. "Hanyang", that's the original name of Seoul, a more poetic word than "downtown", and a wide area encompassing a significant number stations... except the one supposed to be Seoul's main hub: sorry, but Seoul Station is not located within fortress walls! The blue axis refers to the future Sinansan Line (Seoul Station-Ansan Jungang): Phase 1 (Yeouido-Gwangmyeong) is expected by 2019, and the rest (Seoul Station-Yeouido + Gwangmyeong-Jungang) by 2022. Seoul city doesn't need to change the program. The purple axis refers to the Sinbundang Line, which Seoul would like to extend all the way to the new Samsong District in Goyang via Gwanghwamun, a project that would also alleviate traffic congestion on Subway Line 3 and Tongil-ro. For the moment, only the Gangnam-Yongsan section of the extension is scheduled (Phase 3 - 2018, via Sinnonhyeon, Nonhyeon, Sinsa, Dongbinggo or Seobinggo, and Ichon). Where would they pass by after that? Seoul mentions a 19.7 km extension between Donbinggo and Samsong, and we've seen similar projects before (see for instance "3 subway lines projects revived ? ", 2 years ago), but this time Pyeongchang-dong could be in the loop: both sides of Jahamun tunnel seem to be awarded a dot in the above "before-after" map, and the other day I saw banners urging local authorities to keep their promises and to deliver the long expected subway... Anyway, intense lobbying should rage everywhere and at all levels until the elections. The pink axis refers to the Suseo High Speed Railway (Suseo-Dongtan KTX - see "New KTX vertical to Gangnam by 2015" - NB: Suseo also in a Korea Train eXpress project to Pyeongtaek). Seoul wants a 30.4 km-long extension between Suseo and Uijeongbu via Cheongnyangni to create a Dongtan-Uijeongbu line. Note that this pink axis doesn't pass by any of the three hubs, which proves that the presentation needs some fixing. - GTX Line A is in the general direction of the "purple axis" (Sinbundang): initially from KINTEX (Ilsan/Goyang) to Dongtan New Town (Hwaseong) via Daegok, Yeonsinnae, Seoul Station, Gangnam Station, and Suseo (NB: the Suseo-Dongtan part corresponds to the KTX, stretching the line to 74.8 km overall). - GTX Line C is in the general direction of the "pink axis" (KTX): from Geumjeong to Uijeongbu via Gwacheon, Yangjae, Gangnam, Cheongnyangni, and Changdong/Sanggye. - Seoul city focuses on the GTX Line B, initially planned from Cheongnyangni to Songdo via Seoul Station, Yongsan, Yeouido, Sindorim, Dangarae, Bupyeong, and Incheon City Hall. But only the Songdo-Dangarae-or-Sindorim section seemed secured. Seoul suggests to change course, and to draw a southern express line across Seoul from Dangarae to Jamsil (30.3 km), via Gangnam of course. Note that GTX is not just 3 times faster than a standard subway, it also has fewer stations, which would shrink a trip from the COEX to Ilsan from 83 to 22 min in case of Line A, or a Songdo-Jamsil from 112 to 39 min according to this newly suggested route. Frankly, I'd like to see a different presentation. If we want to improve the whole system, we need to understand the situation and the dynamics, the challenges. 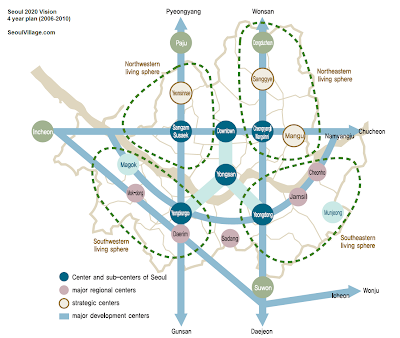 We need to see several maps of Seoul and its sudogweon region with all existing road and railway networks, all the projects already in the pipe, the ones already in discussion, but also the mountains and valleys, the demographics, the fluxes by transportation modes, the hubs and nodes, the bottlenecks of today and tomorrow (e.g. New Towns)... We need to visualize the present and the future. Of course this map is debatable too. But here, we know much more what's going on, and what the city has in mind. 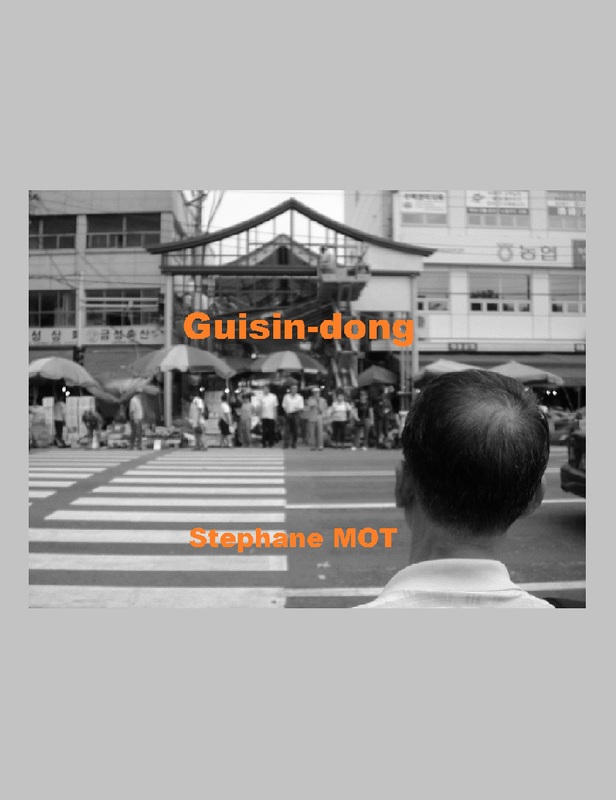 We also know that before thinking Songdo, Dongtan or Uijeongbu, Seoul thinks - as it should - Incheon, Daejeon, Chuncheon, or Pyeongyang (talking about the big picture and tomorrow challenges!). Furthermore, we visualize a much more relevant selection of main hubs: we're neither forgetting Yongsan, nor neglecting the considerable effort around Sangam-Susaek and Cheongnyangni-Wangsimni to boost Northwest and Northwest Seoul and relieve downtown bottlenecks at the same time. So back to the drawing board. And more maps, please. I love maps. "Seoul LRT Projects Update (Part 1/2)"
"Seoul LRT Projects Update (Part 2/2)"
Firstly, you said that Park Won Soon ought to "embrace pragmatism, and among other things stop offering free meals to the wealthiest." Though I cannot argue against that statement, why should anyone else offer free meals or anything else to anyone else? I think it's safe to say that firstly, I have no right to your money. Then, to use that logic, what right do you have to my money? What right does anyone have to anyone else's money? People should pay for their own way and if they are too poor to do so, they ought to rely on charity - not government-sanctioned theft. Secondly, you said, "At this moment, just like Korea has a welfare deficit, Seoul has a railway deficit, so if you ain't broke, fix it." The problem, besides the moral one that I just mentioned earlier, is that Seoul IS broke. ₩26 trillion in the red, as the Korea Herald pointed out. Thank you John for yout comment. Morally, I believe there's a path between communism and Tea Party ideologies, which both end up negating democracy. And budget-wise, I believe Seoul must be as transparent as possible in an election year and in challenging times: OK for investing, but show us also some savings, and prove us the long term value of your plan.